The automatic tracking device in a player piano can legitimately be compared to the steering wheel in an automobile because it's only function is to keep the music roll 'between the lines'. (As stated above, it actually keeps the holes in the roll lined up with the holes in the trackerbar.) And in much the same way as a driver uses his or her eyes to 'read the road', the automatic tracking device has 'eyes' that read the edge/s of the music roll. These 'eyes', or sensors, come in two basic forms. The first, and most common type of sensors, are small holes located at the far left and right ends of the trackerbar. Sometimes there are two holes at each end (see image just below). Sometimes there is only one hole at each end. And, in rare cases, there is only one hole, which is always on the left end. The second type of sensor is called a 'finger'. There can be one or two fingers, but they both work the same way. As the roll passes over the trackerbar, the finger/s touches the edge of the paper, sensing its position. For information about Adjusting Tracking Fingers - click here. In all cases, the movement of the paper (either to the right or to the left of 'center') 'opens' or 'closes' the sensors which in turn cause another part of the tracking system to react to the change. When this 'other part' (the trackeing device) reacts, it attempts to 'steer' the music roll back to the 'center of the road' (or 'on track') where it belongs. When the music roll is 'off track', the music becomes muddled, jumbled, intermittent, weak, or the music may stop playing altogether. Before beginning the test, make sure you're using a music roll that has nice flat smooth edges. 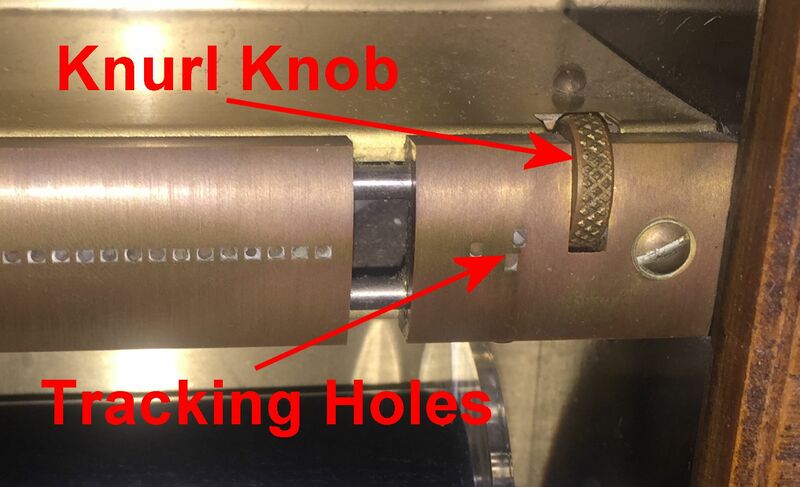 Rolls with curled or worn edges can cause roll tracking problems. To begin the test, put on a roll as usual and turn the Tempo setting to '10'. Run the roll for a foot or so and then stop pumping or turn off the electric vacuum pump. Next, check to see if the holes and the roll are lining up with the holes in the trackerbar. To see how correctly aligned holes look, click here. Also check to see if both edges of the music roll are equally spaced between the traching holes. 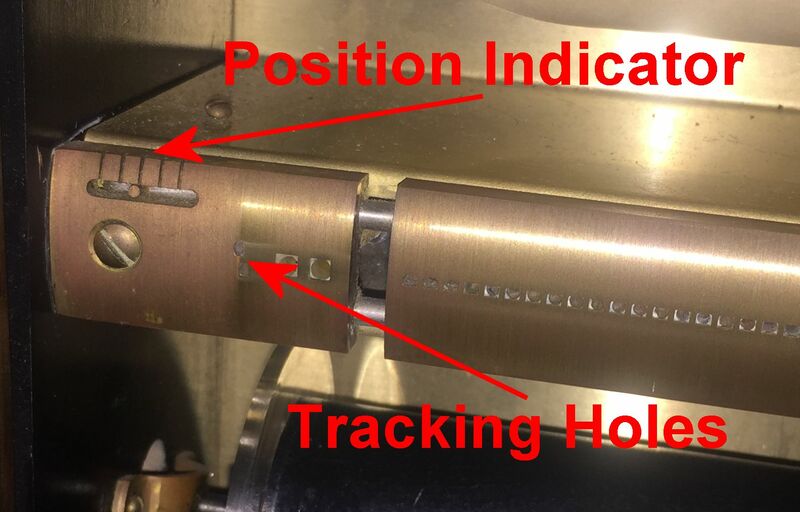 If the holes in the roll don't line up with the holes in the trackerbar or the edges aren't splitting the tracking holes equally, you have a problem with the tracking system. Next, start pumping again or turn on the electric pump. Alternately, close the tracking holes on the left and right with your finger. A light pressure is all that's required. When you do this, you should be able to see the music roll shift position. As you cover the hole on the left edge, the roll should shift to the right, and as you close the hole on the right, the roll should shift to the left. Next, close and open both sensors simultaneously. This should cause the roll to move to a central position. If you can see the tracking device, you can also watch it as you are performing these tests. If the tracking system performed as explained above, the system is working properly. If not, there is a problem with the device. For some information about Tracking Problems - click here. If you have a four-hole tracking system and everything has worked correctly so far, you are ready to begin the final part of the test. This requires a different setup. Reroll the music roll but leave it in place in the spoolbox and decrease the Tempo to '0'. Using scotch tape, cover all of the note holes. Start pumping or turn on the electric pump. Alternately close and open the holes marked 2 and 3 in the picture above. As you close 2, the roll should shift to the right. As you close 3, the roll should shift to the left. If the tracking system performed as explained above, the system is working properly. If not, there is a problem with the device. For some information about Tracking Problems - click here. NOTE: Player pianos that come factory equipped with an electric vacuum pump often have a sensor switch that gets activated when the music roll paper completes one full wind around the take-up spool. This lever most often rests in a groove on the upper side of the spool. If your unit has such a lever, raise the lever so that it is 'out' of the groove, and then tape it 'up' so that it will stay out of the groove until the test is completed. In one make of player piano, raising the lever automatically activates a switch which turns 'on' the electric vacuum pump. This is not a problem because all of the note holes have already been covered. Return to above-click here. NOTE 1: A significant number of the modern player pianos made by the Aeolian Corporation have what's called a Transposing Trackerbar. While it was designed to allow customers to change the key of the music, many people use it to position the trackerbar so that their rolls play faithfully when their automatic roll tracking device isn't working properly. To determine if your transposing trackerbar is being used in this manner, simply turn the knurl knob on the right end of the trackerbar so that the position indicator on the left end is aligned the the center mark. See images below. Now play a roll. If the holes in the roll aren't aligned with the holes in the trackerbar, the automatic tracking device isn't working properly. To see images of good and bad roll tracking, click here.